Kelantan cuisine is influenced quite a bit by the cuisine of Thailand and it’s popular among people from Malaysia. A lot of the visitors which Kelantan receives come to the area in order to taste its recipes, which are not available in other areas. One of the things which their kitchen is based on is sugar and the result is that most dishes from the area are sweet. Another thing about it is the fact that it uses a lot of coconut milk, more than any other cuisine from Malaysia. Their curries are creamy and rich and their taste is based on the Thai cuisine. Below are the foods which are based on the Kelantan cuisine and don’t have influences from Thailand. The Nasi Dagang mixes brown and white rice and it cooks the mix with some coconut milk, garlic, spices and onions. In most cases the recipe is complemented by chicken curry or fish, plus a chili paste. 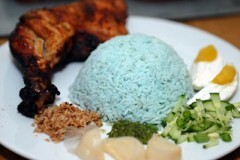 The meaning of this name is rice salad and it is a recipe which Kelantan has its own version of. This salad is usually a combo of leaves and vegetables and it’s served with salted egg, fried fish, pickled garlic and chillies which have grated coconut and minced fish inside. Another thing about this recipe is that it must come with the budu sauce in order to be right. This recipe is basically rice which is offered in a banana leaf which is cone shaped. The Nasi Tumpang pack has meat floss, sweet gravy, omelette, shrimp and chicken curry. Travelers usually eat this type of food. This is a chicken which is broiled with wood fire and it’s dressed with a gravy from sweet coconut. It’s served in many cases during feasts and it’s served together with white rice. A lot of people from Kelantan love this food during their breakfast. The food is basically rice, chicken or fish, plus vegetables which were cooked with yellow gravy and tumeric. This is a combination of white rice with a number of raw vegetables. If you’re looking for healthy dishes, this is one of the better ones from the Malay cuisine. This is made from squid, prawns or fish and it’s basically Kelantan crackers. They are boiled or steamed, they are sliced thinly and they are dried either to be cooked further or stored.